Ranked for 12 consecutive years in the top three countries in the World Bank’s (WB) Ease of Doing Business index, Singapore is one of the most attractive places for businesses worldwide. Singapore constantly attracts new corporations and start-ups. The WB’s “Starting a Business” indicator ranks Singapore at sixth position with an average time to start a business of 2.5 days. Especially for new and innovative corporations, intellectual property (IP) is highly important. Singapore is ranked in several major IP rankings in the top ten as a place with a very high level of IP protection. On the Global Innovation Index 2018, Singapore is ranked as the fifth most innovative place worldwide. Singapore also presents a gateway to the one of the world’s most dynamic economic bloc – The Association of Southeast Asian Nations (ASEAN). With its ten member states and a population of more than 600 million inhabitants, ASEAN represents one of the biggest and fastest growing markets in the world. Besides manufacturing and construction, utilities also contribute to the country’s GDP. Key sectors in manufacturing are electronics, chemicals, biomedical sciences, logistics as well as transport engineering. As a largely service-based economy, services also play a major role in contributing to the national GDP. Especially finance and insurance, business services, and wholesale and retail are key contributors. Besides, transportation services also play a major role as Singapore is situated strategically in South East Asia alongside the major maritime trade routes between Europe and Asia. Services in information and communication technology also play a valuable role in the Singapore Economy. In recent years, Singapore’s start-up sector has experienced a rapid growth. Due to several government initiatives and funding, Singapore is today a hotspot for establishing start-ups. Singapore can also be viewed as an entrance market for start-ups to access the ASEAN market. 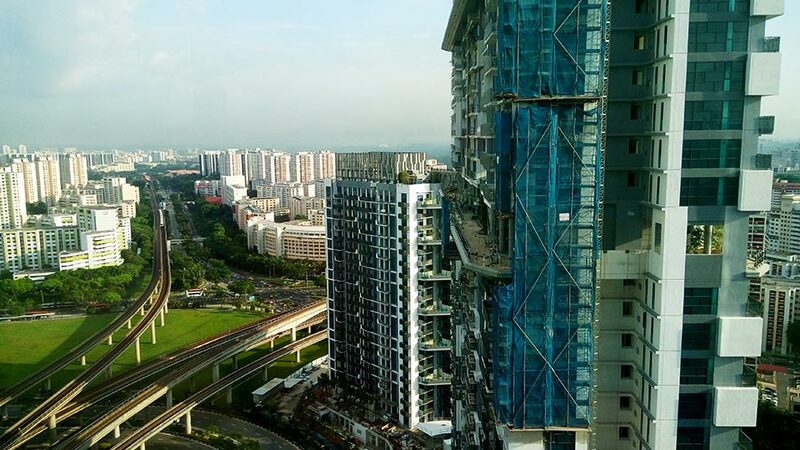 Despite a slower GDP growth in the third quarter of 2018 of 2.2 percent on a year-to-year (y-to-y) basis, the Singaporean Economy is expected to grow between 3 percent and 3.5 percent in 2018 – more than the expected 2.5 percent to 3.5 percent growth. Augmentation in goods producing industries declined in the third quarter to 2.3 percent from 7.5 percent in the previous year. Service Producing Industries remained relatively stable at a growth rate of 2.4 percent in comparison a rate of 2.8 percent in the previous quarter. On a y-to-y basis, the total merchandise trade rose in the third quarter of 2018 by about 14.7 percent. The total service trade increased at the same time by 3 percent. Manufacturing businesses grew 3.5 percent on a y-to-y basis while construction declined around 2.3 percent in the third quarter of 2018. Especially information and communication business with a growth of 4.7 percent, and the finance and insurance sector with 5.6 percent were the main drivers of growth in the services sector. Accommodation and food services with a growth of 4 percent in the third quarter of 2018 and business services with 2.4 percent were further drivers of the Singapore service sector’s growth. The investment climate in Singapore is dominated by relatively low corporate taxes and a liberal economic system. More than 99 percent of all trade through Singapore is duty-free. Combined with the ease in establishing businesses, Singapore provides a perfect environment for corporations. In April 2018, the Singapore FinTech fast-track initiative was launched to provide a faster patent service to innovations in the FinTech sector. By this initiative, FinTech corporations can be granted patents after six months and not like for other applicants, which are granted after a minimum time of two years. Legislative changes regarding the annual return of businesses have been implemented in August 2018, providing a different reporting structure. In 2018, several major trade agreements between Singapore and other countries were signed. Most importantly Singapore has signed a Free Trade Agreement (FTA) with the European Union (EU) at the end of the year, which will be ratified in 2019. The Agreement eliminates the vast majority of tariffs on goods as well as on services. Alongside this deal, an Investment Protection Agreement introducing a new dispute settlement mechanism has been signed. The China-Singapore FTA Upgrade deal has also been signed. It provides the opening up of China’s services sector, especially for Singapore’s financial and legal services. Considering the importance of Singapore as a hub for money going in and out of China and the difficulty to enter the Chinese financial market, this agreement will consolidate Singapore’s standing as a global financial hub. GDP growth in 2019 is expected to be around 1.5 percent to 3.5 percent, according to the Ministry for Trade and Industry. The risk of a further escalation in the trade war between the US and China could blur the economic expectations for 2019. Shortages in global capital could also have a negative impact on Singapore’s economy as potential investors may pull money out of emerging markets. The moderate growth of Singapore’s economy is partially due to potential weaker demand in electronics and engineering products. Especially outward oriented business sectors like wholesale trade, transportation and finance and insurance are expected to moderately grow in 2019. Resilience is expected in the information and communications as well as education, health and social services sectors as the demand for IT solutions will remain strong. The construction sector is expected to improve as several building contracts are expected to be implemented.